JGarden Description: This garden had its beginnings as part of a Japanese Village exhibit for the 1894 California Midwinter International Exposition in San Francisco. Since then it has weathered many changes, including the banishment to internment camps in 1942 of the family who had given the garden to the city and cared for it since its creation. It is the oldest Japanese-style garden in the United States. The five-acre stroll garden contains a rather eclectic collection of sub-gardens, buildings and artifacts, many with fascinating stories. Some of its prominent features are a high drum bridge (taiko-bashi), a five-story red pagoda, a dry landscape garden (karesansui), a chain of ponds, a teahouse, a large bronze Buddha (cast in 1790 and presented to the garden by S.&G. Gump Company in 1949) and numerous lanterns and other fixtures. Several people were involved in the design and construction of the original garden, but the most credit is certainly due to Baron Hagiwara Makoto, a prominent Japanese landscape designer who lived at, built, bankrolled and cared for the site from 1895 until his death in 1925. His son-in-law, daughter and grandchildren continued in his footsteps until 1942. A very sad chapter in the history of the garden ensued, with its caretakers evicted and name changed to the more politically acceptable �Oriental Tea Garden.� Many of the structures built and owned by the Hagiwaras were destroyed, one important building was downgraded to a gift shop, and Baron Hagiwara�s Shinto Shrine was removed. Some incongruity was introduced at this time when a Buddhist pagoda was moved into the shrine enclosure so that the Shinto torii gate faces the pagoda instead of a shrine, as it should. 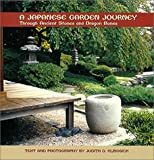 After the war the garden was eventually renamed �Japanese Tea Garden� and various improvements were undertaken, including the addition in 1953 of the 9,000-pound Lantern of Peace, donated on behalf of the children of Japan, and the construction of the Zen Garden by Sakurai Nagao. Mr. Sakurai was also commissioned to redesign the entire pond area in front of the teahouse in 1960. Another major redevelopment began in 1965 when a large collection of dwarf trees, lanterns and stones originally belonging to the Hagiwaras was returned to the garden. The Hagiwaras had entrusted the items to a friend when they were interned in 1942. Many other projects followed in the ensuing years, including a new landscape with Mt. Fuji as the main theme which was designed by E.J. Schuster in 1979, and the restoration of three aging gates by Kawata Kensuke, one of Japan�s leading temple and shrine builders, in 1985. The garden has also been the recipient of numerous gifts of statuary and artifacts. Hagiwara Makoto and his family were finally honored in 1974 with the erection of a large stone and bronze plaque designed and made by sculptress Ruth Asawa. 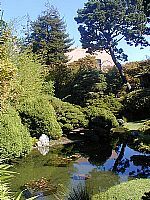 The San Francisco Recreation & Park Department, which has maintained the garden since 1942, named the road bordering the garden Hagiwara Tea Garden Drive in 1986 to further honor the garden�s original benefactors. The web site for Golden Gate Park includes a 360 degree panorama of the garden. Brown, Kendall H. "Rashomon: the multiple histories of the Japanese Tea Garden at Golden Gate Park". Studies in the History of Gardens and Designed Landscapes. vol 18 no 2 (April-June 1998), pp 93-119. Ishihara Tanso and Wickham, Gloria. The Japanese Tea Garden in Golden Gate Park 1893-1942. Privately Published, 1979. McClintock, Elizabeth. The Japanese Tea Garden, Golden Gate Park, San Francisco, California.. The John McClaren Society, 1977.